Easterbrook Discovery and Moreland Middle Schools have been awarded Innovation Grants through the Moreland Education Foundation (MEF) Small Grants Program. December 5, 2018, San Jose, CA: Easterbrook Discovery and Moreland Middle Schools have been awarded Innovation Grants through the Moreland Education Foundation (MEF) Small Grants Program. 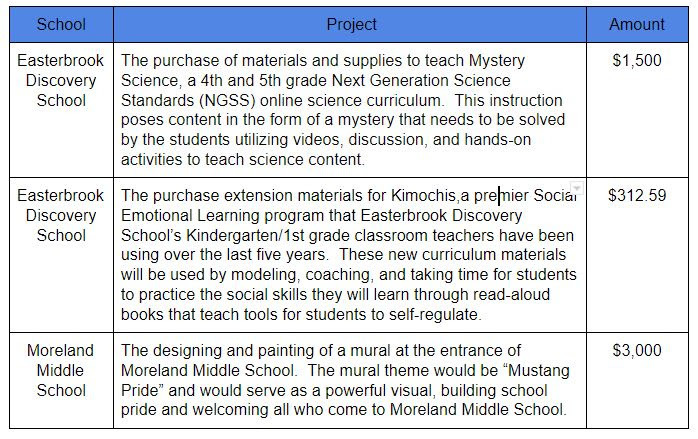 MEF awarded almost $5,000 in grant money to the two schools who applied and presented their ideas for three different grants at the November MEF Board Meeting. The following schools received grants for programs or materials that go beyond the school budget. 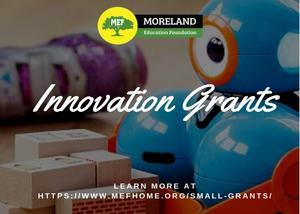 The MEF Innovation Grants program supports innovative and creative approaches to education in all areas of learning and student enrichment, including Project Based Learning, staff development, school climate enrichment, and parent education. The goal for the MEF small grants program is to identify programs that once established successfully can be sustained and modeled by others in the Moreland School District.